If you're like me, hearing "new movie by Gareth Evans" immediately causes visions of The Raid 3 dancing in your head. Sadly, that ain't happening...yet, but a new film by the celebrated action director is exciting news no matter what, and the little bit we've seen and heard of Apostle has been pretty crazy. But can the director known for his insane fight flicks make the transition to something with a bit more psychological intensity? Based on the first trailer for Apostle the answer is a definite "yes", and Evans' gift for maddening camera angle looks especially effective in ramping up the film's creepiness factor. 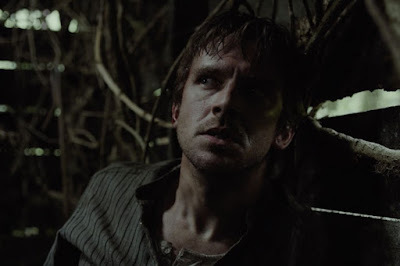 Dan Stevens stars in the horror as a man who infiltrates a religious cult to retrieve his kidnapped sister, and what unfolds is a threat that he won't be able to punch his way out of. Alongside Stevens the film includes Michael Sheen as the cult's charismatic leader, Lucy Boynton, Bill Milner, and Kristine Froseth. Yeah, the plot is a little similar to The Wicker Man but this already looks a lot more gruesome. The crank of the vice, people strung up in trees...this definitely won't be for the squeamish. Here's the synopsis: London, 1905. Prodigal son Thomas Richardson (Dan Stevens) has returned home, only to learn that his sister is being held for ransom by a religious cult. Determined to get her back at any cost, Thomas travels to the idyllic island where the cult lives under the leadership of the charismatic Prophet Malcolm (Michael Sheen). As Thomas infiltrates the island’s community, he learns that the corruption of mainland society that they claim to reject has infested the cult’s ranks nonetheless – and uncovers a secret far more evil than he could have imagined. Written and directed by Gareth Evans (THE RAID), APOSTLE is a harrowing occult fable where the only thing more horrifying than madness is the sinister reality behind it. Apostle will hit Netflix on October 12th.